Can we just reschedule, all their feet looked good weeks ago…. I’ll call you when they need to be trimmed…. Can we not trim today it’s to hot-cold wet-etc. I need to cancel our appointment; my kids want to go get a happy meal…. Eight months ago when I had her trimmed she acted fine, you must be hurting her…. Oh God! She’s bleeding……oh good, it’s just your thumb…. My chickens use the horses back to get closer to the rafters, does that bother you? I used to trim him in the fronts and it was HARD! You could drive a nice truck for what you charge. I would clean out all four feet but Baby doesn’t like that…. He’ll quit trying to kick once he gets to know you better. Can you do this____________, I just read about it on the internet? I’m short on funds so can you trim all 10 and I’ll pay you next time? If I tell all my friends to use you, I think we should get a group rate? I would trim her myself but she tries to cow-kick me…. If any of them act up, just hit them with your rasp like the last farrier did…. If they do anything stupid you have 3 seconds to do anything you want…. The last 3 farriers just didn’t understand my horse…. You better hurry up and finish, I’m running out of animal crackers…. Just trim them all really short this time and I’ll call you in four months…. Can you trim my pot bellied pig? Hahahahaha!!! I have heard most of those too...except that it is goats and once a lama with me...never did a pig before :) Cute picture though! I actually do most of the canceling due to "too wet" because the other thing I hear is "oh, I don't have a barn or trimming area, you could do him in the shelter though" which is often either ankle deep in mud or 10X8ft with a jumpy horse...sigh...how hard is it to put up four posts with a plywood roof in an area that is fairly level and only used for trimming/grooming/etc??? 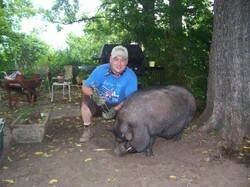 Maybe I should become a "pig whisperer"
I've got to ask. What caused you to change from a traditional farrier to a barefoot trimmer? My husband is a fairly newly certified trimmer and we are getting resistance bordering on violence from the local farriers. It's uglier than the 2008 Presidential Race! Well, I try to give you the short answer. I started shoeing horse with my grandfather when I was about 14 years old (1980). Everything was cool. I had learned a lot from my father and grandfather, but they wanted me to go to horseshoeing school. Then in 1990, I graduated from Kentucky Horseshoeing School. That's where my barefoot path started. The more I learned about how the hoof works, the harder it was to continue to shoe. It took me four more years to go cold turkey. I nailed on my last set of shoes in 1994. Not on horses, but on a pair of Devonshire oxen in Massechusetts. At first, I still trimmed a "barefoot" horse like I was just getting ready to shoe it. I was looking for more of a natural process and came up with my trimming style. My granddad always said, "Cooperation, not competition." And that is my approach with the farriers around me. They are the ones in competition and I just nod my head and agree to disagree. I'm not saying farriers are wrong and bad people, I just want to do what's best for the horse. Why don't I shoe? Because I choose to be part of the solution, not part of the problem. "He´ll only stand still while I am scratching his private parts." "Be careful, she bites very hard when you lift her feet, two people have to hold her head." "I have not had the time to get the horse from the pasture, can you do that?" I could not find the horse this morning, you and me have to go and look for it." Thanks for the laugh!! I have to forward this to my trimmer. She will love it! 2. Don't mind the dogs, they love horse hoof..as the dogs have noses two inches from hoof. Heehee! My husband and I have horses and potbellied pigs, and we trim both ourselves. The pigs are easy to trim once you know the technique and if you have two people, one strong. One person stands straddling the pig, facing their head. That person then reaches under the pig's front legs and sits down with the pig, so that both the person and the pig are sitting on their rear-ends with their legs sticking out in front of them. The other person trims as fast as possible. Ear plugs are advised, as is "blood stop" powder or flour in case you nick the quick. These are great, love your sense of humor Jim! You must have a lot of patience. Keep up the great work, the horses need you! Jim - I tried to communicate before but its taking me a while to figure how to work this technology. I'd like to talk to you on the email because our prob here in Oz is that there is a huge divide between the farriers and the trimmers. And we'd like to bridge it. But the farriers think we are a mad lot of witches (and to some extent they are right). Its a demographic thing too...the farriers are all tough hard working men (mostly) of few words and the trimmers are (mostly) middle aged women, fighting middle aged spread who are very voluable and love learning about biomechanics and hoof function. If they suggest that hoof walls are not designed to be the primary weight bearing structure, then the farriers will shake their heads and wander off and have a beer with each other and write us off. But there are no where near enough barefoot trimmers around to service the growing demand and the obvious people to step in and help are the farriers. However, some farriers now SAY they do a barefoot trim. It involves trimming the foot as if to prepare it for shoeing. You know the style. Oh yes, And adding a bit of a mustang roll at the front. But they can't resist rasping the sole flat at the toe. and dressing the walls from the outside. And slicing and dicing the frog to make it pretty. I'd like to talk to you about how you think we might be able to communicate with the farriers given that farriers and barefoot trimmers come from such a different philosophical starting place. The difference being...farriers believe that the shoe protects the hoof and therefore the horse, and barefoot trimmers believe that the shoe is damaging to the horse. Any ideas? I'm asking whether we can email privately only because this typepad is intended to be about the use of hoof boots. And this is slightly off topic. OMG LOL!!! I just have to make sure.... That's a PIG? Which end is the front?! Jen, who's never seen a PB pig, let alone imagined one gettign a trim! the pig is facing the camera! His owners found him roaming the steets of Nashville, Tennesssee when he was just a shote. His feet are all overgrown like a foundered donkey, but thats as close as I could get to him......... I told the owner to call a vet and give me a call when the vet was comming out, but i havent heard back. I think i'll stick with horses.